It looks like Samsung Galaxy Note 2 owners will be in for a Christmas treat as word on the Android 4.3 Jelly Bean update suggests it's almost ready to roll out. According to SamMobile, it has managed to get hold of a new version of the update which it claims is close to the final build. 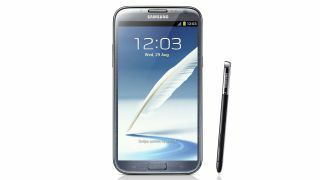 The newer Samsung Galaxy Note 3 already sports Android 4.3, while the latest version of Jelly Bean is also being rolled out to the flagship Galaxy S4 and the older Galaxy S3 - although there have been some problems with it. Galaxy Note 2 owners will be treated to some new features thanks to the Android 4.3 upgrade, including access to Samsung Knox - a security set up for business users - and Samsung Wallet, allowing you to manage your spending and various loyalty cards. Android 4.3 also bring various improvements and tweaks, but there are no major wholesale changes, with a lot of the difference occurring in the background of the OS. There's currently no official release date for the Android 4.3 Galaxy Note 2 roll out, but with the way the update is progressing users may be in for a nice Christmas present from Samsung.